Banasurasagar is a large dam built across a tributary of Kabini river in Wayanad. The reservoir backwaters comprise of various small islands. There is boating facility available at the Dam. 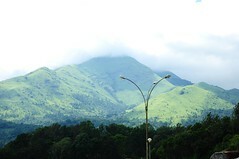 The Banasura hills form the back drop of the dam. The Banasurra hills is an excellent trekking destination. Forest department permission is required to trek the hills. Best time to visit Banasurasagar is after the rains. August to February will be a good time. The nearest towns with food and accomodation facilities are Kalpetta and Mananthavady. Banasurasagar is 300km from Bangalore. KeralaSRTC and KarnatakaSRTC runs direct service to Sulthan Bathery in Wayanad. From Bathery Private and KeralaSRTC bsues are available to Panamaram. From Panamaram(25km away) KeralaSRTC and Private buses are available to Panjarethara. From Padinjarethara, Banasurasagar dam is only 4km away.